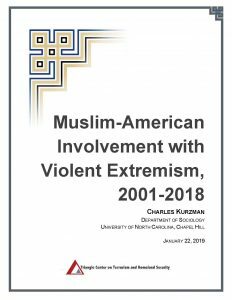 Coverage by Religion News Service, January 25, 2019; Luxemburger Wort, January 29, 2019; podcast interview with Sophia Ramos of the Institute for the Arts and Humanities at the University of North Carolina, Chapel Hill, January 31, 2019. Coverage by Religion News Service, January 18, 2018; Voice of America (VOA) News, January 18, 2018. US News and World Report, February 26, 2013. Interview with Rev. Welton Gaddy,”State of Belief” radio program, February 9, 2013. Interview with Michael Shure, “The Young Turks,” Current TV, February 26, 2013. Coverage in The New York Times, February 8, 2012.
Review of the study by Congressman Peter King, March 9, 2011: “I’d say it’s a biased report.” More….